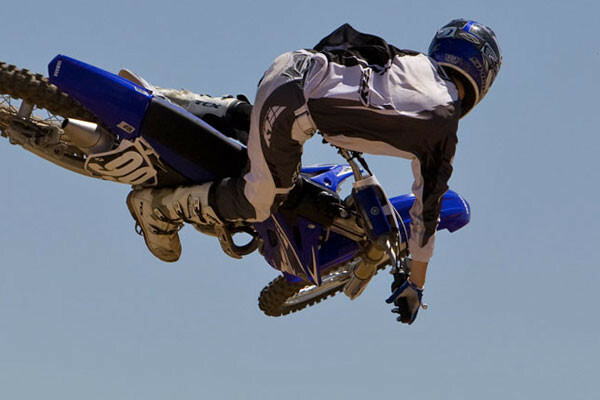 Click the following link for a video of the 2009 Yamaha YZ250F in action. You can also click the following link for a 15-photo gallery of photos of the 2009 Yamaha YZ250F. As usual, you can click any image here for a larger version. Sure, Yamaha nabbed the Lites West Supercross Championship in ’08, but they’re not sitting back and admiring their number one plate. They’ve made a bunch of changes to their best-selling off-road model, the YZ250F. In the engine department, Yamaha’s engineers wanted to add a low-to-mid boost to the powerband, and they accomplished it via several mods. They lengthened the exhaust’s titanium headpipe by 60mm in the 35mm-diameter section where it exits the cylinder. They also changed the midpipe to a single 50.8mm dimension, and shortened the muffler by 50mm, which gave an added benefit of centralizing the weight. Also add in some revised ignition mapping, a richer needle and leaner carb fuel screw spec, and you get exactly what they were looking for…a nice boost in the low-to-midrange power over the ’08 model. We borrowed Wil Hahn for the day (before he signed up his ’09 deal to ride for the MDK/KTM squad), and he made for a good tester, because with his practice bike, he’d spent quite a bit of time aboard a relatively stock YZ250F. Wil definitely felt the improvements that Yamaha had made to the engine, and was impressed with the boost in performance. The clutch also received some attention, with a new clutch basket that features eight rubber dampers, rather than the six coil judder springs found on the ’08 model. All the steel plates are also now the same, which results in easier maintenance that mechanics will appreciate. It should also result in less metallic residue in the oil. For ergonomics, the top triple clamp has been changed, and by moving the handlebar clamps to either the forward or backward position, combined with rotating the offset bar clamps forward or backwards, you can put the bars in one of four different positions...10mm back, standard, 10mm forward and 20mm forward. That’s something that taller riders will definitely appreciate. If you like the bend and sweep of your bars, and want to adjust the height of the stock bars upward, you can also replace the bar clamps with a set from a YZ450, since they’re 4mm taller. They’ve also added an adjuster to the clutch lever that allows easy reach adjustment over a 10mm range, so you can fine-tune to your heart’s content. There’s also a new adjust on the clutch lever assembly, as well as in-line adjusters for the hot start and clutch cables. Look for an all-new swingarm in the rear, as well as a new compact rear hub. Nope, you can't use your old wheels with the new bike, due to a new larger (from 22mm to 25mm).. The bulk of big changes are found at the rear end of the bike, with a completely redesigned swingarm that featured hydroformed construction. It’s over 350 grams lighter than the previous swingarm, and has a difference rigidity balance that Yamaha says is designed to help with cornering by eliminating a tendency for the bike to want to stand up in corners. They’ve done this by working to reduce torsional twist and vertical rigidity of the swingarm, while boosting its horizontal rigidity. The rear suspension linkage has also been moved underneath the swingarm (the upper rocker mount no longer goes through the swingarm—instead, it mounts underneath), but all the same rear suspension geometry is retained. That means there are no more unsightly plastic caps in the middle of the swingarm, and the swingarm has a much smoother overall look. As for suspension settings, the spring rate remains the same, they’ve swapped out a click here and there in the front and rear, and the titanium rear shock spring has been replaced with a standard steel unit. The Yamaha gets a new front sneaker this year...a Bridgestone M403A that features a flatter tread pattern; and the also worked on the flex characteristics of the new swingarm in an effort to keep the bike planted in ruts and through corners..
Yamaha also redesigned a bunch of the components in the rear of the bike, with a new compact rear hub (complete with a larger 25mm rear axle) that they claim is 265 grams lighter than the previous design, despite using three smaller bearings versus the two in the old hub. What else is new? Well, the Pro Taper bars aren’t, but they’re a cool OE item. There’s a different seat cover that still has an anti-slip surface, but which cleans up more easily than in the past. The valve cover is another item that gets minor appearance tweaks, with a matching black finish to what you’ll find on the clutch, oil filter and ignitions covers. There’s also a new D.I.D. chain that features gold-colored outer plates, which will also make them much more rust-resistant than in the past. As they had last year, you can get a standard blue model, or an all-white with black and red graphics. Either way, you get a well-proven bike with a solid slate of upgrades for ’09. Be sure to check the video and photo gallery links above, and look for the bike at your local Yamaha dealer. Liquid-cooled 250cc, five-titanium-valved, DOHC, four-stroke is powerful and highly tractable, with a redline for competition crushing pulling power. 37mm Keihin® FCR flat-slide carburetor with throttle position sensor (TPS) ensures precise fuel/air mixing and lightning-quick throttle response. Slick, five-speed transmission with heavy-duty, multiplate clutch features an involute spline setup, ensuring smooth shifting and instant hookup under power. Magnesium cylinder head cover—now covered in matte black— helps shave weight. Speed-Sensitive System 48mm KYB® fork damping force is controlled by piston speed which provides a smoother, more precise ride. Four-way adjustable, rear shock with Kashima-coated internals reduces friction for fantastic compliance and great handling. Lightweight front wheel hub allows for reduced unsprung weight and increased durability. Lightweight front and rear brake calipers with aluminum pistons and anti-bubble front master cylinder; wave-style rotors reduce unsprung weight and deliver strong stopping power. Wide (55mm) footpegs provide excellent boot traction and rider comfort. ProTaper® handlebar with durable, comfortable grips. Please refer to the Yamaha Off-Road Accessories & Apparel Catalog or go to yamaha-motor.com.